While wartime strategy games are one of the evergreen genres of both board and PC gaming, they’re much less of a presence on console; outside of steadfast staples like the Romance of the Three Kingdoms series, historical takes on the turn-based formula are particularly scarce. CIRCLE’s Conqueror series brought this concept to the 3DS eShop with releases such as World Conqueror 3D and European Conqueror 3D, and now it’s back for another round on Switch. Channelling board game classics such as Axis & Allies and Risk, with a World War II setting and fun, strategic gameplay, World Conqueror X is a solidly enjoyable effort despite a few missteps. 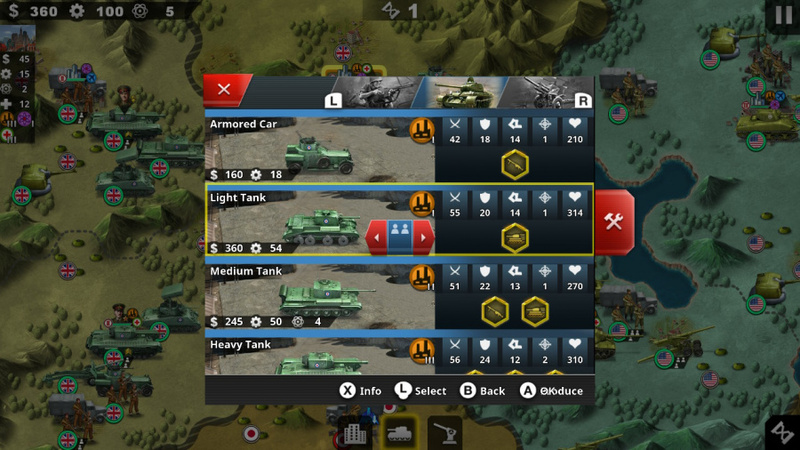 Once you get your boots on the ground, World Conquerer X plays similarly to Advance Wars or other grid-based strategy games: taking turns with your computer-controlled opponent(s), you’ll be able to move each of your units - from foot soldiers and tanks to cannons and submarines - across the map, and set them on any enemies within range. Rather than starting and being stuck with a set number of fighters as in Fire Emblem, here you can use your resources to recruit new units on the fly. You can also bolster defences by building bunkers, mines, or anti-aircraft guns, order airstrikes and missiles, and develop any cities you’re currently occupying to boost the income coming into the coffers each turn. These basics are the basis for World Conqueror X’s two distinct game styles: Scenario and Conquest. Scenario is a mission mode, where you’ll choose between the Allied or Axis side (starting in Europe, with the Pacific Theatre available later) and proceed through a series of discrete tactical puzzles. These stages are based on actual battles, and so the victory conditions are accordingly diverse; winning might mean taking a certain city, repelling an assault, or holding on while outnumbered long enough for reinforcements to arrive. That variety, along with the relatively brief mission length - many take fewer than 20 turns - makes Scenario mode perfect for shorter play sessions or on-the-go conquest, and the focused nature of each stage keeps them feeling fresh and fun as you go. 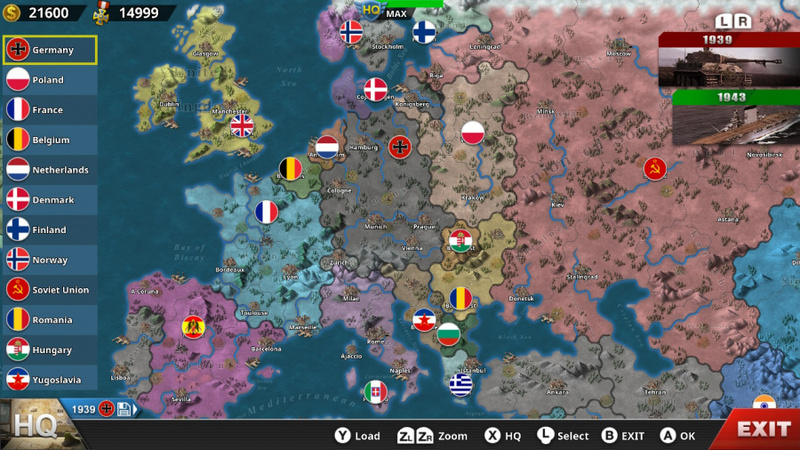 Conquest mode, on the other hand, is a massive undertaking that sees you selecting a single country - from heavy hitters such as Germany or the USSR to smaller states a la Greece or Thailand - starting in 1939 or 1943, and simply trying to win the war. Your historically-correct allies will aid you during their own turns, and you have some stripped-down ‘diplomacy’ options (give money to allies or draw new opponents into the war), but other than that, it’s you versus the world. It’s an absolute slog, though that’s not meant as a criticism; it’s just an uphill battle fought on a dizzying number of simultaneous fronts, and it does an excellent job of driving home the enormity of the exercise. 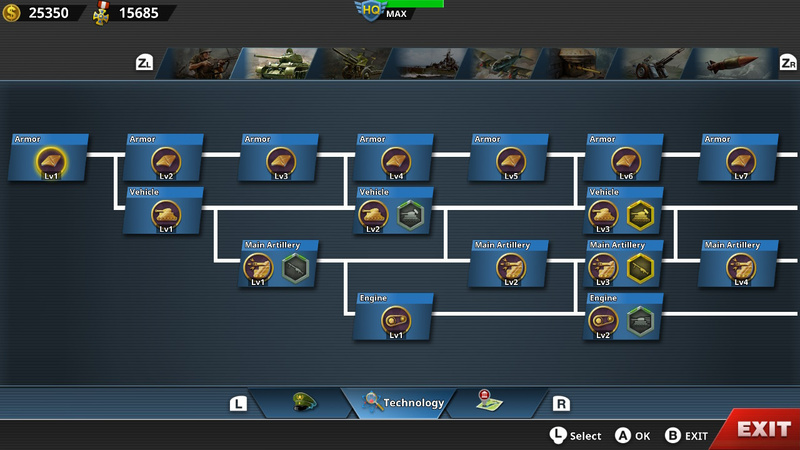 Handily, you can save and come back to your game at any time (though with only one save slot, you can’t hop back and forth between countries), and since it’s independent of the Scenario mode sequence, chipping away at Conquest makes for a nice change of pace from the main missions. In both modes, World Conqueror X brings a few unique wrinkles to the otherwise standard strategy template. Morale plays a heavy role, for instance; units who are surrounded or flanked will lose morale, and have lowered defences as a result, while troops just after a decisive win might get a boost to their attack power. You can also raise spirits by building certain amenities in cities you control, or by calling in the big guns with one of the many generals available for recruitment. After ‘hiring’ generals in the HQ mode through medals earned in the game, you can deploy them to a specific unit in battle to help turn the tide with their considerable strength. In keeping with the theme, these are real-life generals, and each general’s powers are generally linked to their careers - Nimitz and Yamamoto are strong in naval units and airstrikes, for instance, while Graziani and MacArthur are most at home on land. One big difference, however, is that their in-game avatars have no scruples about helping out either side; if your dream is to have Rommel pinch-hit for the Republic of China, you can make it happen here. From the turn-based strategy to the potential for fan-fiction with its generals, World Conquered X is a lot of fun. That said, it does have a few issues that can get in the way. The first is that many of its mechanics are vastly under-explained. The included tutorials are a start, but they spend more time on broad concepts (such as movement and morale) than on the nuts and bolts, with the result that we had to stumble around for several missions before we figured out how to recruit new troops, build bunkers, or upgrade units. There’s also a notable lack of clarity on what exactly different actions accomplish - upgrading troops seems like a good idea, sure, but there’s no specific indication of what’s improved - and a general feeling that you don’t always have all the information you need. There’s no preemptive report on possible outcomes before you order an attack, for instance, and no indication of how troops, cities, or structures affect your incoming resources. For a genre built on stats and numbers, the obfuscation is disappointing. The second issue we encounter is again related to a lack of information, and specifically on what goes on in enemy turns. 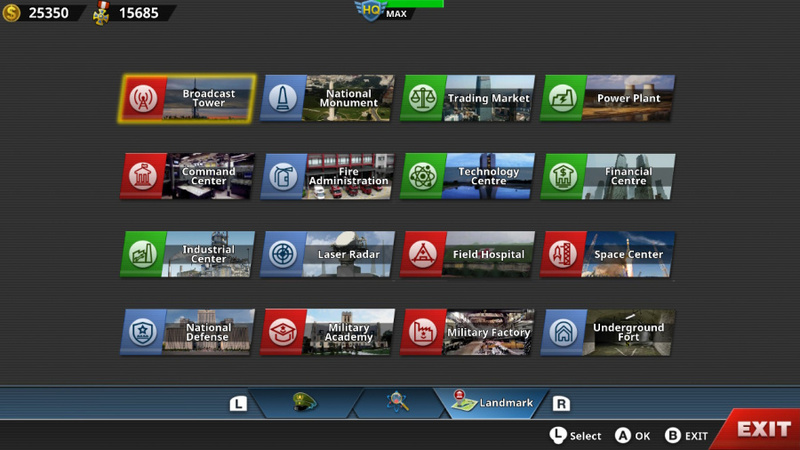 Though game speed is adjustable, your options when you’re not in control are limited to watching the computer take its turn in full, or skipping it entirely with a press of the ‘+’ button. The problem is that a lot can happen in a single turn, and you either miss out on all of it, or sit through a long series of shuffles and skirmishes and try and remember all the relevant details. 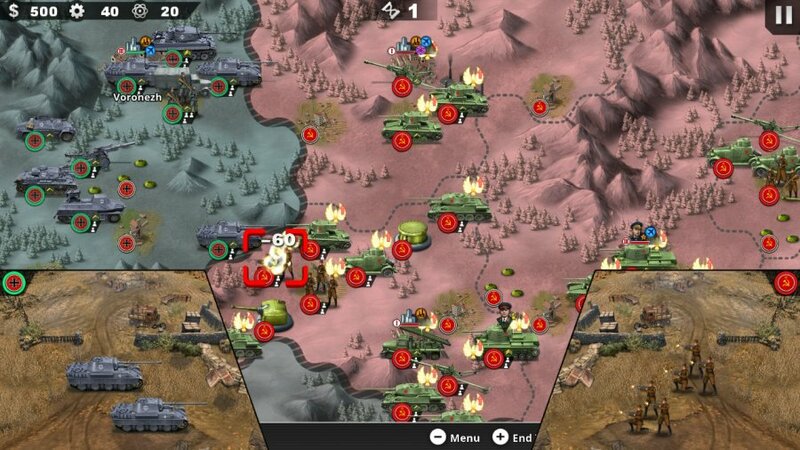 It’s particularly egregious in Conquest mode, where enemy turns can take upwards of five minutes (!) to play out — in one instance, we get up to make a cup of tea and came back to the AI still playing away. Some sort of highlight summary between rounds would be a huge help, but as it stands, it’s tough to keep strategic tabs on everything that transpires before you’re back in control. Graphically, World Conqueror X is a notable update from the series’ 3DS days. It’s nothing fancy, but the colourful cartography built on softened hexagons backs up the board game gameplay with an appropriately tabletop aesthetic. Pleasantly copy-pasted details such as forests, mountains, and deserts give the feel of an unfolded paper map, and aside from a few text alignment issues, it’s a nice look. We would have appreciated a bit more visual variety in terms of troops and cities - Paris is thematically indistinguishable from Phnom Penh, which seems like a bit of a miss - but overall, the crisp, clean style is excellent. The music - with themes and motifs returning from the 3DS entries - is similarly well done, with particular care given to dynamic shifts. Its martial drums, strings, and horns stay largely in the background for long stretches of time, so that when they finally do swell up into strong, foregrounded melodies, the morale boost is palpable. It’s a smart move that keeps the small soundtrack from ever feeling too repetitive, even in longer Conquest sessions. 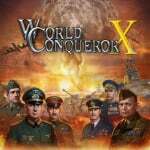 Finally, it’s worth noting that while World Conquerer X isn’t exactly graphic in the usual sense of the word - there’s no blood or gore, and defeated units simply blink off the battlefield with a few frames of animation - it’s steeped in the actual atrocities of World War II, and certain images and historical photographs could potentially be uncomfortable. The swastikas and Rising Suns have been airbrushed away, but the intent remains, and it’s fair to say that many players may place gameplay objectives such as 'Invade Poland' or 'Deploy an atomic bomb' somewhere between distasteful and disturbing. Of course, if you have an interest in the period, this history (and alternate histories) may be appealing in itself, but World Conqueror X’s real-World War basis means that it’s harder to ignore (much less enjoy) the violence here than in purely fictional affairs like Advance Wars. It’s not out to break new ground, but with enjoyable strategy gameplay and an appealing board game aesthetic, World Conquerer X is certainly a welcome addition to the Switch’s library. Minimal tutorials and under-explained mechanics make it easy to feel overwhelmed at the outset, but new recruits who stick it out will find plenty of strategic fun in both the bite-sized Scenario missions and globe-spanning madness of Conquest mode. A significant improvement from earlier games on 3DS, and a solid recommendation for war-gamers. The price is very reasonable for essentially a port. I read elsewhere that it's best to play this in handheld mode to take advantage of the touchscreen controls. $10 isn't bad for a 7/10 game(atleast, for me anyway). will look into getting soon. Another reviewer called it something along the lines of "an entry point into the grand strategy genre", which may be very good for me, as I am simply not smart enough for Paradox titles (even Stellaris gives me headaches and that's the easiest one). It sounds perfect for the Switch. I'm not a fan of removing swastikas and rising suns; if it's a game about history it should be represented faithfully, as abhorrent as it was. But I understand that an EU version of the game would hide away the swastikas due to German laws. And it is on a Nintendo console at the end of the day. But one could argue that hammer and sickle similarly shouldn't get a pass. As a Polish person I have no love for either. "Invade Poland" as an objective doesn't trigger me, that's what has happened and I'd rather not have people forget my country's history. Not to mention it's fun to play "the bad guy"
Good to see a bit of variety on the eShop. Probably not one for me but a well rounded library can only be a good thing. Good to see more strategy on Nintendo hardware. The assumption by games companies that most console owners are dumb kids needs to be challenged as much as possible. I thought about buying this when they had a preorder discount but wanted to wait until a review was out. Sounds like a solid game, I'll add it to my wish list. @uhhhhhhhh You can play as one of the Allied countries in this too you know. You can even attempt to stop the Blitz as Poland (good luck). @SmaggTheSmug Well said. It's not like any of this stuff goes away. The Soviet Union and Maoist China (admittedly a little later) committed more atrocities than Nazi Germany and Japan combined, why do they get a pass if we're getting all censory? @FantasiaWHT The simplest answer is: they didn't lose that war and "history is written by the victors". Love these sorts of games and wish we could get an advance wars or Civilization on switch. This will tide me over. @cmk8 Would love Civ on the Switch but I might need to make my commute even longer! well argued but you might also say that there are many maoist and stalinist apologists in academia and politics in the west. The game is quite good and what a relief for not having IAP and pay-to-win mechanics. I'm waitig for Neo Atlas 1459 for my Switch strategy fix, but this looks reasonable for it's cheap price. Anyway, i hate how random "fun adventure" movies can have swastikas on their completely inaccurate Nazi villains, but a slow paced stategy game that actually requires thinking and does actally at least somewhat deal with historical events can't because Germany recognizes movies as art worthy of protection from censorship but doesn't recognize video games. It's also embarassing how game developers/publishers bow down to this nonsense and even go beyond what is necessary - i strongly doubt Germany has a law that forbids to show a Charly Chaplin-like moustache in video games, yet Wolfenstein TNC removed that in it's german version. This game seems interesting, but it also seems like an overly complicated Risk. Took a punt cos of the price Although played Command and Conquer back in PS1 days havent played this type of game in years. Doesn't feel cheap and deep enough. This game is just a game... but I can't help but feel uncomfortable playing as Nazi Germany invading Poland or France, or Imperial Japan invading China and Korea. The gameplay sounds interesting and pretty solid to me. But I wish they'd done an alternate history approach or just fictional countries. I don't mind playing a game like Civ 6 because clearly Germany wasn't a force in the 200 AD and was never allied with the Aztecs. But if I am gonna play a game that is based on real history, I'd rather not champion a country that tried wiping out entire races, or an Empire that was particularly brutal to it's enemies. @Heavyarms55 - is this a bad time to point out that your profile pic looks like a play on the Imperial Japanese flag? @Filbert_Wang fair comparison I suppose.